1 NATIVE AMERICAN DAYS Native Americans at the University of Iowa are planning a conference for February 11 through the 15. The Chicano Indian American Center together with Indians from surrounding communities wish to share with all peoples an exploration of Native American Values. The conference has been titled, "Native American Perspective in Music and Thought: Traditional Approaches to Land Use and Community." Scheduled to speak or perform are roger Buffalohead, Eddie Benton, Lee Cook, Paul Ortega, Buddy Redbow and Floyd Westerman. All speeches and performances (as well as a Pow-Wow) will take place at the Iowa Memorial Union (Iowa City), except for a performance at the Iowa State Penitentiary at Ft. Madison which is not open to the public. A performance by students from South Tama High School will take place at MacBride Auditorium. Topics the conference hope to focus on include: principles of tribal/community responsibility; AIM & the BIA; Native American values in the university and broader societies; and finally, the conference will include much Native American poetry and songs. Much work has been done already in preparing for this conference. Much work remains yet to be done. Many people are working in exchange for a successful conference.. The people attending the conference will determine whether it is a success or not. So, we should go ready with questions, new ideas and a willingness to learn. Sleeping space for out-of-towners is available. For information concerning sleeping space or whatever call the CIACC at (319) 353-4753 or 6014. Or you can get in touch with John Salter, project director at (319) 353-5001 or 3(?)51-0758. 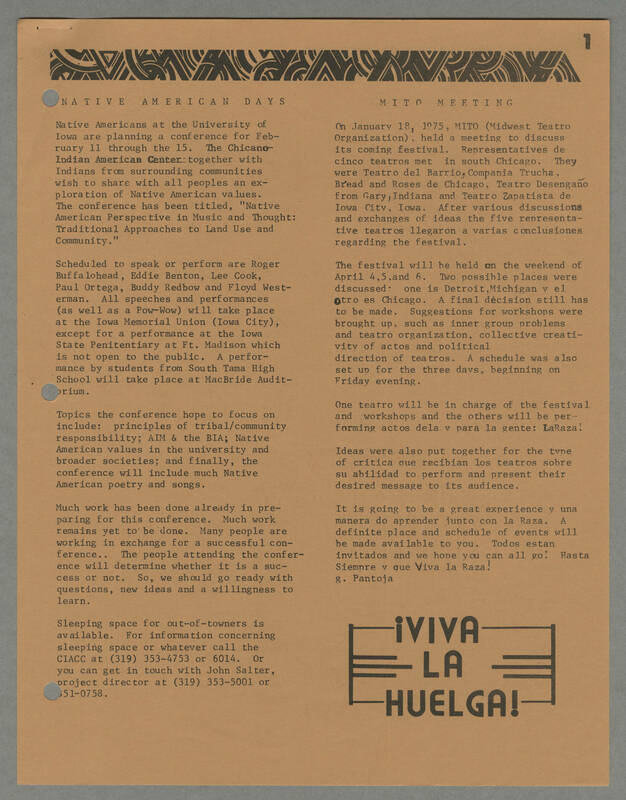 MITO MEETING On January 18, 1975, MITO (Midwest Teatro Organization) held a meeting to discuss its coming festival. Representatives de cinco teatros met in sough Chicago. They were Teatro del Barrio, Compania Trucha, Bread and Roses de Chicago, Teatro Desengano from Gary, Indiana and Teatro Zapatista de Iowa City, Iowa. After various discussions and exchanges of ideas the five representative teatros llegaron a varias conclusiones regarding the festival. The festival will be held on the weekend of April 4, 5,and 6. Two possible places were discussed: one is Detroit,Michigan y el otro es Chicago. A final decision still has to be made. Suggestions for workshops were brought up, such as inner group problems and teatro organization, collective creativity of actos and political direction of teatros. A schedule was also set up for the three days, beginning on Friday evening. One teatro will be in charge of the festival and workshops and the others will be performing actos dela y para la gente: LaRaza! Ideas were also put together for the type of critica que recibian los teatros sobre suabilidad to perform and present their desired message to its audience. It is going to be a great experience y una manera do aprender junto con la Raza. A definite place and schedule of events will be made avilable to you. Todos estan invitados and we hope you can all go! Hasta Siempre y que Viva la Raza! g. Pantoja [[upside down exclamation point]]VIVA LA HUELGA!